As you may have read, the tail-end of 2013 brought a lot of bike misery to me. I had my long serving and much abused mountain bike stolen, I replaced it with a hybrid and, after just 11 days, that was stolen too. Luckily a friend of a friend (who runs a bike shop) took sympathy on me and offered to sell me a good bike at a great price. While researching for the first hybrid I’d looked at the Dr Dew but I have a real problem with Cyklotkeket since their staff pretty much ignored me when I wanted to buy my racer and then when I asked for help told me they didn’t have time because the shop would shut in 15 minutes. Now I had a second chance to get the same bike at a better price and from a nicer place. I went for a quick test ride and was convinced this would be a good bike for me. It was comfy to ride, seemed to be well-specced, didn’t have the lockable front suspension which had annoyed me a little on my Specialized hybrid and would be fitted with the lights, speedo etc that were stolen along with the last bike. We agreed on a price and I gave the shop a few days to get it in order before going to collect it. I then cycled back across Stockholm to my work. Almost immediately I started to regret my decision. Cycling was a nightmare. I pedaled and pedaled but seemed to go nowhere. Sure, it was windy but it wasn’t that bad, was it? Oh well, too late now so I took the bike home, waited a few days for the wind to die down and tried again. Talk about a difference! It was easy to ride, I could keep up a fairly high speed without too much effort and it was not nearly as jarring as I bashed up and down kerbs compared with the Specialized and that lockable suspension. Now came the only problem. I wanted to go out for a ride but had no time during the day and it was dark already at night. I’m a bit of a scaredy cat when it comes to riding new bikes and prefer to be able to have an easy bedding in period where I only ride in nice conditions and on roads I know. Weeks went by with just short spurts when dropping off my son at day care or zooming to the shops but no long rides. Finally I got an hour to myself and went for a quick spin. My initial negativity is now totally washed away and I love it. The two main gripes I had with the Specialized Crosstail were the lockable front forks (see above) and also the fairly uncomfortable hand-grips. No such issues on the Kona. The brakes are also very good and were particularly strong in the wet which was nice. What I have heard is that the main difference between the 2013 and 2014 models will be a downgrade of the brakes so, if you are thinking of getting one, I highly recommend you strike now. Yes, the vivid lime green colour of the 2014 model is a bit more eye-catching but I’d rather have a bike that will stop on demand than one that is a little bit prettier. Do you ride one? Are you pleased with it? If you have anything you want to share on Kona or on the Dr Dew, don’t hesitate to leave a comment. 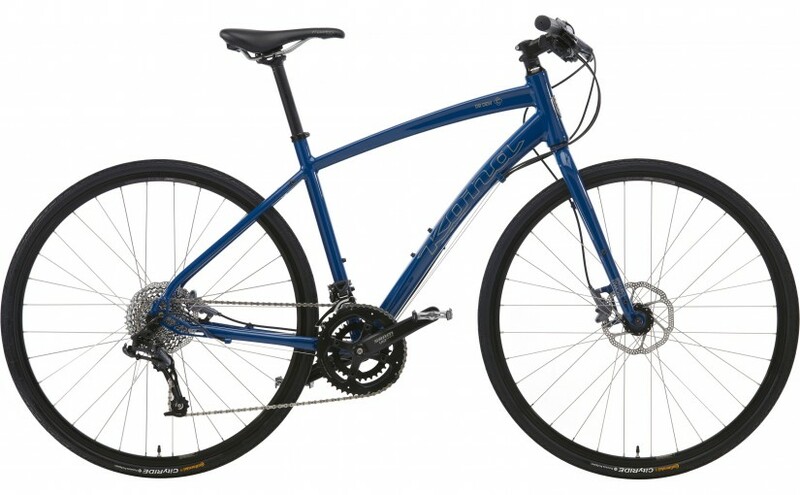 Hello there, thinking of buying one of these, just wondered if you had been anywhere of 60 miles kind of distance, using b roads etc….. really I am wondering if this is a pure City only bike or whether I can do touring with it. Also how are the velo gearing, do you have any problems with the hills? I’ve not really been out on any long rides on the bike yet. I’ve been training for a big road race so mostly used the Kona for school runs, heading out to the shops etc. Having said that, I don’t see why it couldn’t be used as a long distance tourer. It’s got anchor points for panniers if you want to add them and a very comfortable seat. My only problem with the gearing is a quite large jump between two gears in the mid-range somewhere but that just took a little bit of getting used to. No problems on hills that I’ve noticed. I have to say that I am totally happy with it. Best of luck on your touring. I have had one of these for a few months and love it. Like you, i have been very impressed with the brakes on the 2013 model. I got mine for a great price.